When doing High Scissors on the Mat one leg is reaching UP while the other leg is reaching AWAY! This prepares you for High Bicycle and Shoulder Bridge. I used to think I slayed at this exercise. I had one leg reaching forward and the other leg hanging over my chest and face. I mean, you're supposed to split the legs right? Ish! If you're a glutton for wrist pain and lower back compression then go ahead. But, if you want to really lift out of your lower back, take the weight of your chest and wrists and really prepare yourself for High Bicycle and Shoulder Bridge than reach one leg up and the other leg forward. It's not easy but then if it was it probably would be Pilates! Laying on your back bend your knees into your chest and roll your hips up to the ceiling. Bend your elbows and slip your hands on your seat guiding it up. Straighten both legs up to the ceiling and lift out of your lower back. If you feel a lot of pressure on your wrists reach your legs more UP. Press your head and shoulders back into the mat and reach one leg up as the other leg reaches away. Press that leg forward 2x and the pull the leg back and switch. Repeat 3x each side before going into your High Bicycle. 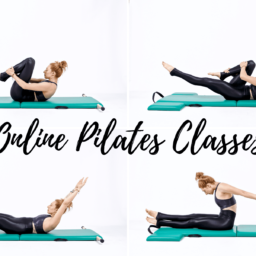 Opposition is key in Pilates. The more your seat and legs reach up and the more you ground down on your head, shoulders and elbows the more freedom you will have to scissor your legs. It's easy to make this exercise bigger but bigger doesn't always mean better. In fact, in the High Scissors the more connected you are to your seat the stronger you'll be as you continue through your mat practice. And, we always do each exercise to prepare us for the next. So, while not super picturesque to keep your legs more up and forward your booty will be super grateful.